Eos Chasma lies at the eastern end of the vast Valles Marineris canyon system, and it has long been on mission planners' wish lists for Mars rover landing sites. It was a candidate for the 2003 Mars Exploration Rover mission (Spirit and Opportunity) and more recently it was in the running for NASA's next Mars rover mission, the Mars Science Laboratory, due for launch in 2011. In the last section below, we'll explore why this site has been twice to the church but never wed. (Hint: something in the air.) Yet regardless of the difficulties it presents to mission planners, this site is of prime scientific interest and won't disappear anytime soon from the roster of desireable landing places. The image here is a mosaic of frames taken during daytime at infrared wavelengths by the Thermal Emission Imaging System (THEMIS), a multi-band visual and infrared camera on board NASA's Mars Odyssey orbiter. It captures the scene in mid-afternoon, with cooler areas appearing dark and warmer ones (those facing the Sun most directly) appearing bright. Big angular blocks tilted this way and that, hills that push up from a flat floor — such are characteristic signs of what Mars scientists call "chaotic terrain." This type of landscape develops, scientists think, when underground water — abundant amounts of it — is abruptly released by tectonic or volcanic activity. In fact, all of Valles Marineris appears to have been created by the opening of fractures extending east from the giant Tharsis volcanic region. Subsurface water escaped catastrophically through the fractures, eroded the canyons, and eventually poured out the east end of the valley into the northern lowlands. Here and to the west of this scene lies a carpet of hills and angular blocks from which water has burst forth. In this scenario, areas of chaotic terrain offer glimpses of the process caught before the floodwaters have completely undermined and destroyed the ground. For scientists, investigating chaotic terrain with a rover, despite the obvious trafficability problems, would give them an unparalleled view into a process that has affected much of Mars. And water-associated sites also provide key looks at places that may preserve traces of ancient life. To create a canyon like Valles Marineris, let alone Eos Chasma, floods gushed across the Martian landscape. But not all flood channels eroded down to the lowest level in the locality. In the case of Eos, for example, a "hanging valley" was left on the north side of the channel. 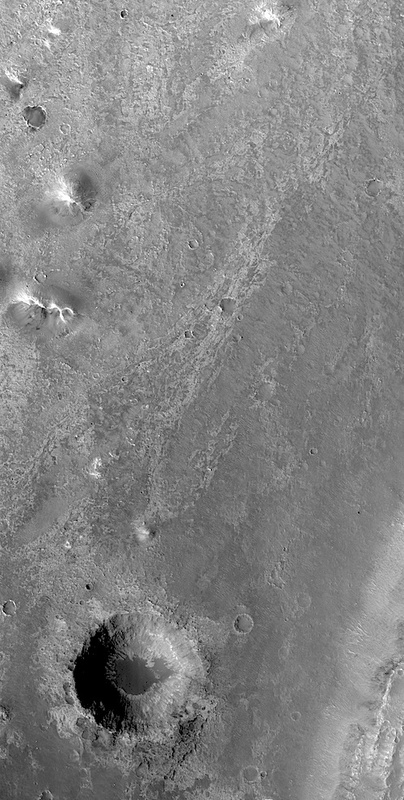 THEMIS images show this as a partly eroded giant mesa, with a wide channel etched into its top. Remarkably, the feature resembles the bed of the Niagara River above the famous Falls, which was revealed in 1969 when engineers dammed the flow going over the American side, effectively turning it off. The scale on Mars, however, is vastly greater. Niagara Falls has a height of 50 meters (160 ft), while the elevation of the Eos hanging valley (if that's what it is) reaches 2,500 meters (8,200 ft). The Eos canyon wall also lacks some features that well-developed waterfalls on Earth show, such as plunge pools, undercut cap rock, and piles of broken debris at the foot of the falls. But then, the Martian floods may not have lasted long enough to create these features. So the case for a mega-falls in Eos remains unproven. But tucked into the western edge of the hanging valley is a fan of alluvial debris. A closer look (see top image at right) shows a narrow channel cutting into the wall of Eos and the top of the fan. It might have carried the last of the water that flowed down from the mesa. This channel is about one kilometer (3,300 ft) wide and 30 meters (100 ft) deep. Water has been central in the history of Eos Chasma and Valles Marineris. Yet at the bottom of the canyon lies a sheet of rock rich in the mineral olivine. On Earth, olivine is a green-colored semiprecious gemstone called peridot. What makes olivine interesting to Mars scientists is that the mineral weathers quickly when exposed to water. Thus its presence in a widespread layer low in the canyon's stack of deposits points to at least one period in the canyon's history that was mostly dry. It also suggests that the climate turned generally dry after the olivine layer was exposed. Here, THEMIS' daytime infrared view records darker patches on the canyon floor. In one place, a small crater, 2,000 meters wide by 300 meters deep (6,600 ft by 1,000 ft), has punched through them. The olivine-rich layer appears dark to THEMIS because the rock outcrops are cooler than the surrounding dusty and sandy material. The zoomed-in image (see right) was taken by the HiRISE camera on Mars Reconnaissance Orbiter. In this view made at visual wavelengths, the olivine-bearing layer appears as generally light in tone. Wind is a chief reason why mission planners have passed up otherwise tempting landing sites here and elsewhere in Valles Marineris. Yes, the valley is home to places with fantastic exploration possibilities — but not at the price of a crash landing. This nighttime infrared view of Eos Chasma from THEMIS suggests caution is justified. Nighttime IR images record the heat radiation given off by the ground deep in the wee hours before sunrise. Under the cold night sky, dust, sand, and fine-grain materials cool off quickly, while exposures of cemented soil, boulder fields, and rock outcrops stay warmer longer. Think of walking barefoot on a terrestrial beach late at night. The sand, almost too hot to walk on at noon, becomes cool to the touch, while the paved parking lot — which at noon actually felt cooler than the sand — still holds daytime warmth. The key to understanding nighttime THEMIS images is to remember that brighter tones mean warmer, hence rockier, areas while darker tints indicate cooler and dustier terrain. In addition, streaks run along the canyon floor, and it's these that gave rover mission planners pause. The light gray streaks indicate where dust and fine sediments have been stripped by winds blowing up the canyon from the east (right side). Turbulent wind eddies created by bumps, hills, and craters on the canyon floor have scoured away light, fine-grain materials, leaving behind bare rock, boulders, and gravel. Computer models suggest the winds are frequent and relatively strong. Could a Mars rover set down safely here? Perhaps. And someday in the future, we may look back and conclude that project engineers were too hasty in ruling this location out for the Mars Science Laboratory. But bitter experience has made mission planners wary. And what those streaks are telling them is that, just as on Earth, winds can go whistling through canyons to create treacherous landing conditions that go beyond what current rover-delivery technology can handle. A channel slices down through an alluvial fan that lies at the edge of a hanging valley overlooking Eos Chasma. This scene, 9.6 kilometers wide, is part of frame ESP_011806_1665, taken by the HiRISE camera on NASA's Mars Reconnaissance Orbiter. A small crater has dug into the floor of Eos Chasma, disrupting a layer of olivine-rich rock. This scene, 6.6 kilometers wide, is part of frame ESP_012940_1655, taken by the HiRISE camera on NASA's Mars Reconnaissance Orbiter. A nighttime infrared view from THEMIS shows streaks on the bottom of Eos Chasma, where winds have stripped away dust and sand. Mission planners see these winds as making the task of landing a rover too difficult.